The Whiteshell Fish Hatchery was built in 1942, and is an important part of Whiteshell history and fishery conservation. The hatchery raises fish from eggs to be stocked in sport fishing lakes across Manitoba, ranging from the United States border and extending up to The Pas. The hatchery is located just off Highway 312 between West Hawk Lake and Ingolf, Ontario. The highway was non-existent when the hatchery was built, so a crude road was built from Highway 44 to bring in materials. Heavy equipment was brought in the winter by horse and sleigh. Inside the interpretive centre at the Whiteshell Fish Hatchery. While it may have been difficult to get in-and-out, this was an ideal location for a fish hatchery. 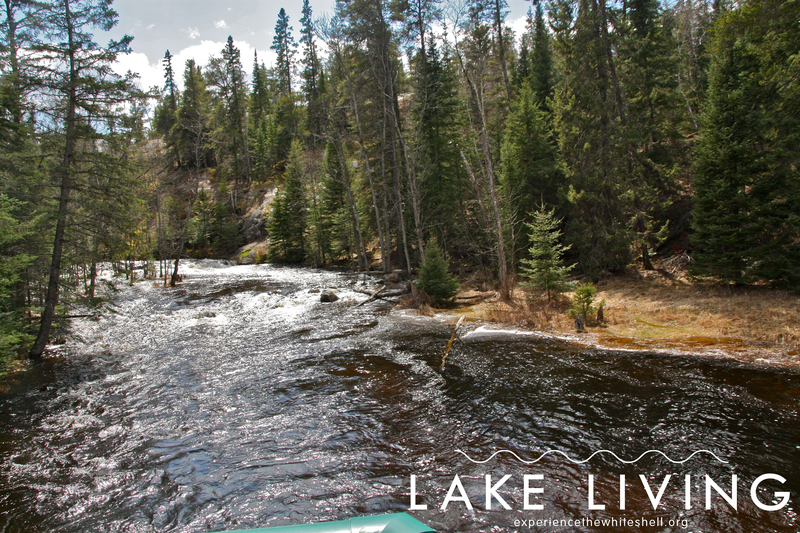 Raising trout requires cold, clean water, so being downstream from West Hawk Lake and having a drop in elevation between West Hawk and the hatchery made for the perfect scenario. 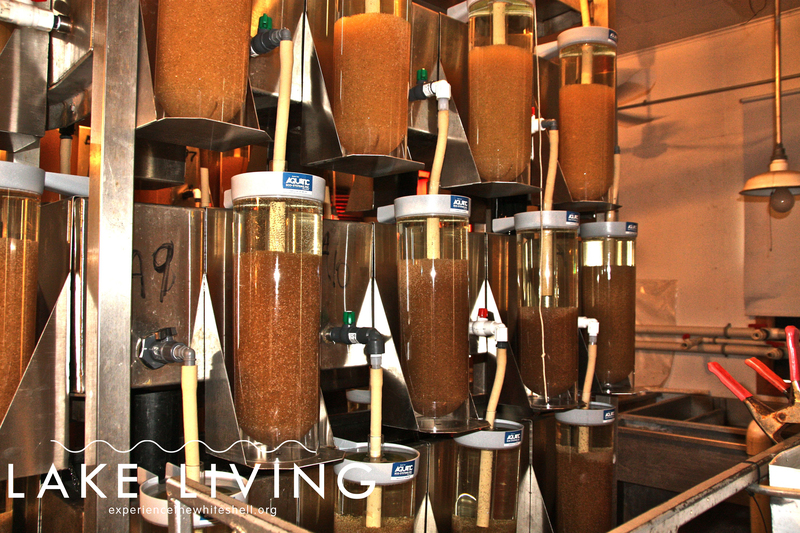 Water is gravity-fed through a filtration system and through the hatchery and back into the creek. The creek that flows through the hatchery from West Hawk Lake to Caddy Lake is stocked with trout by hatchery staff. The creek is a big draw for many fly fishermen. It is currently a busy time of year at the Whiteshell Fish Hatchery as the spring walleye spawning season coming to a close. 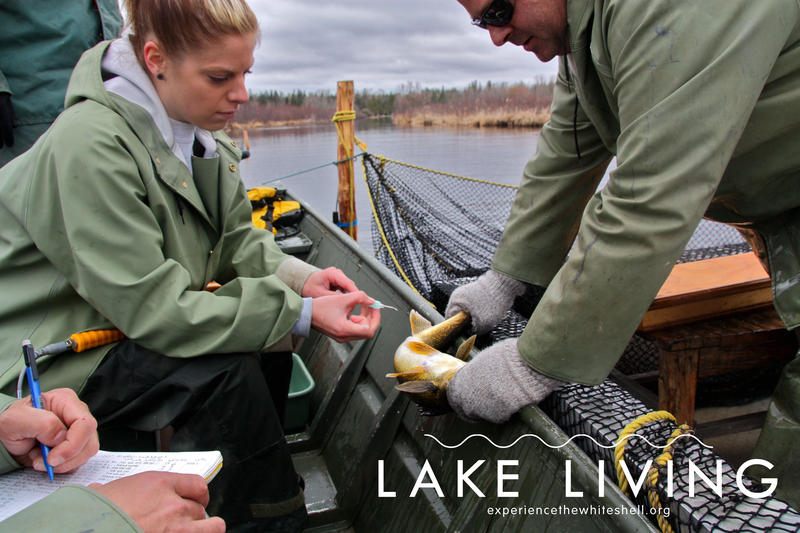 Hatchery staff finished collecting eggs and tagging walleye from Falcon Lake just before the May long weekend and now the eggs are being maintained in the nursery at the hatchery. Tagging walleye on Falcon Lake. 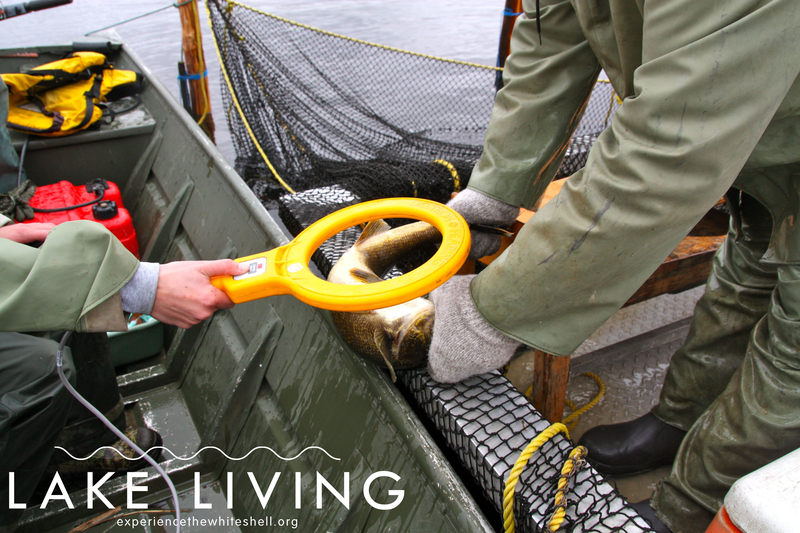 The piece that is inserted into the fish for tagging and tracking purposes. 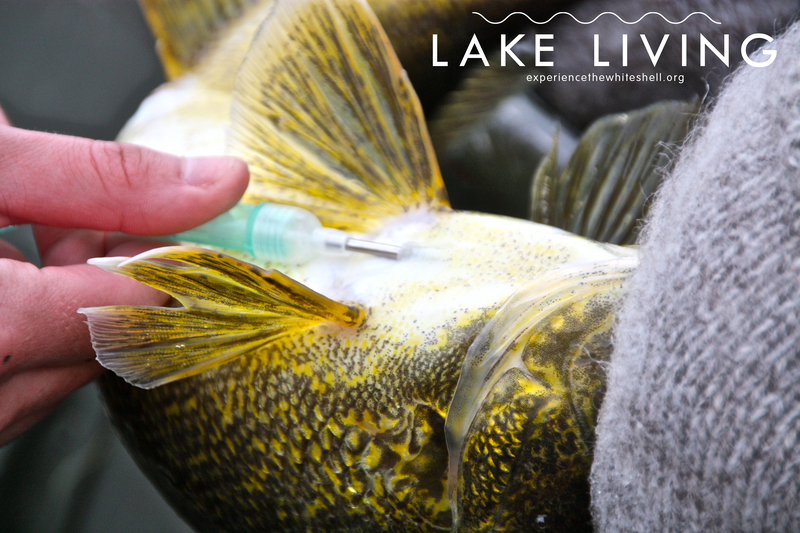 The walleye eggs will remain in incubator containers for about 21 days before reaching the eyed-egg stage, which last about six to ten days for walleye. The eggs then hatch into tiny fish referred to as ‘fry’. 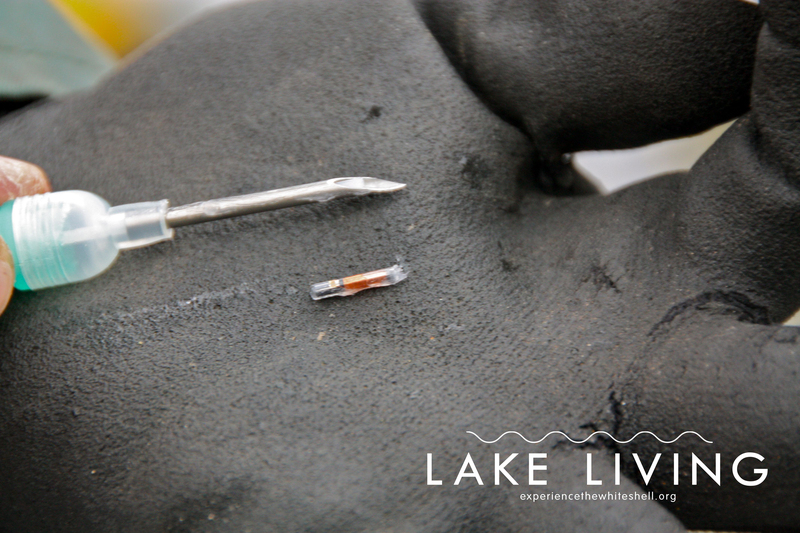 Walleye will be stocked in the fry stage whereas trout will stay at the hatchery until they are fingerlings (2 to 15 cm). 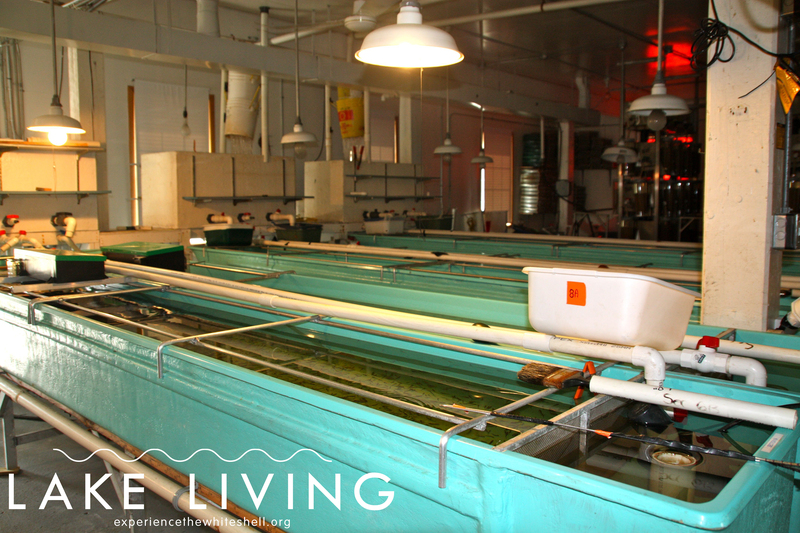 At about 5cm, trout fingerlings are then moved to long narrow outdoor tanks called raceways. The hatchery stocks most trout during fingerling stage but some trout are kept until they are yearlings (18cm). Some fish are kept at the hatchery as brood stock and released as adult fish. Walleye eggs in the incubator containers at the hatchery. The large bins in the nursery where fry develop. The survival rate for young fish at the hatchery can be 80 per cent, whereas in the wild the survival rate is one per cent. The hatchery raises both cool water fish (walleye, northern pike, and lake sturgeon) and cold water fish (rainbow trout, brook trout, brown lake trout, arctic char, and trout hybrids including splake and tiger trout). 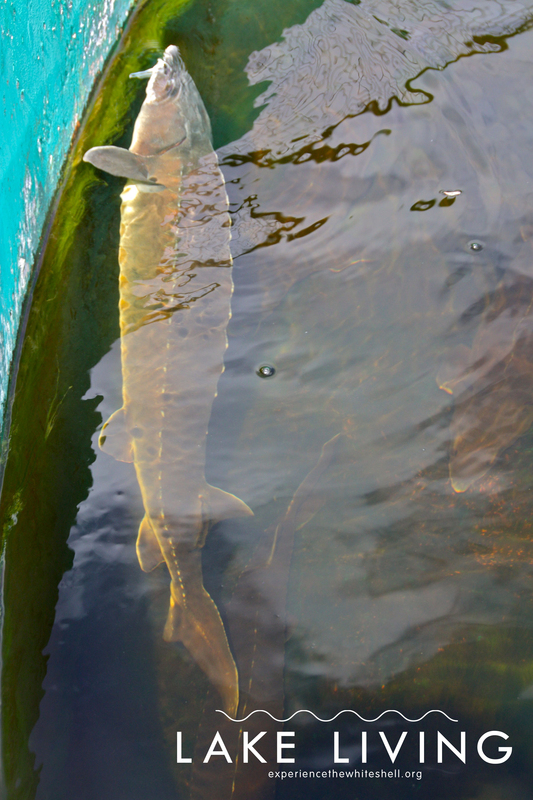 One of the brood stock lake sturgeons at the hatchery. The hatchery has big outdoor tanks where you can see a brood stock that includes brook trout, brown trout, tiger trout, and even lake sturgeon. 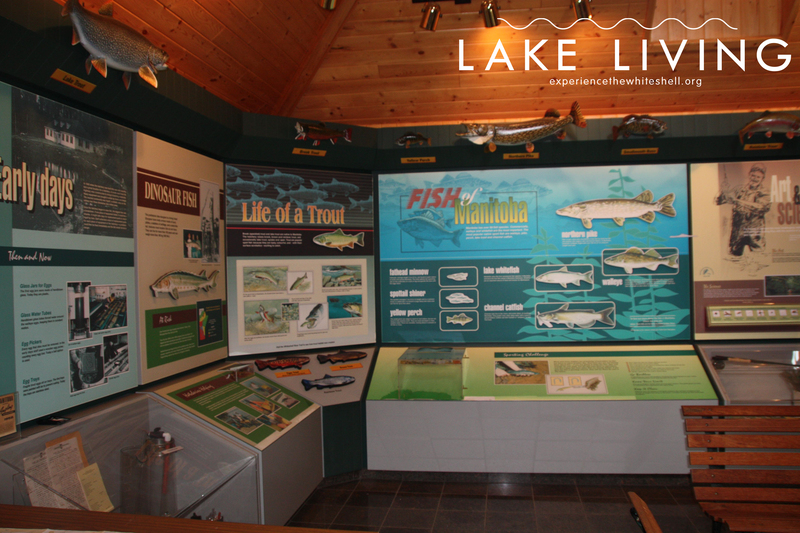 The is also an interpretive centre in one of the buildings where you can learn all about the history of the Whiteshell Fish Hatchery and different breeds of fish in not only the hatchery but all across Manitoba. Hatchery staff also give intrepretive tours, which are a great educational experience for the whole family! Be sure to stop in next time you’re in the Whiteshell. — Writeup ad by Marney Blunt, Experience the Whiteshell editor/manager. With files from the Whiteshell Fish Hatchery. 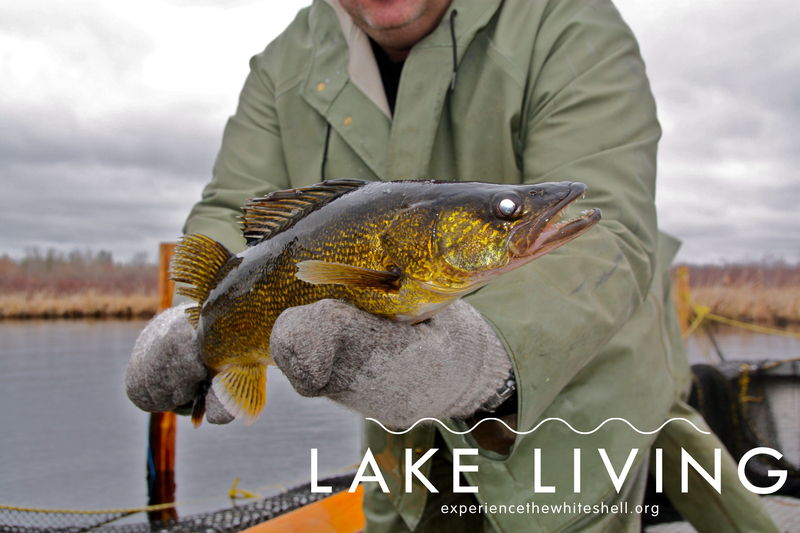 This entry was tagged Caddy Lake, experience the whiteshell, Fish, fishing, Species, Sturgeon, Trout, Walleye, West Hawk Lake, Whiteshell Fish Hatchery, whiteshell provincial park. Bookmark the permalink. We have tried to visit the hatchery on three separate occasions already this summer- and it has been closed. What, are the hours of operation? Perhaps they aren’t open until August?? Love to see the open and tour hours posted, thanks!! Hi Jenn – You can call 1(204)349-2228 to get the hatchery hours. Hope that helps!